Are you thinking about refurbishing your office or reception area over the coming Christmas break? Have you considered the inclusion of a glass staircase and glass balustrades to provide a more open, sophisticated, and modern look? Since the mid-1950s, glass has become increasingly used by architects in the design of buildings and other structures. The Louvre Pyramid in Paris, the Shard in London, and the world’s highest glass bottomed bridge in China, are three of the latest most of us will have heard of. While structures of this sort make the headlines, commercial office blocks, shopping malls, hotels, and houses have, over the years, been designed with greater amounts of glass included in their construction. And there are sound reasons for this use of so much glass, especially in the commercial building sector. Considered to be today’s ‘modern’ building material, the more glass included in the construction, the more modern the building is deemed to be. Glass gives a feeling of wide open spaces, of openness, airiness, and a lighter, brighter environment. Research over the years points to the fact people perform better in light, bright, airy environments. Productivity and creativity increases amongst the workforce, providing higher returns on staff investment. The interior of the building shouldn’t be forgotten either. Whether a three bedroom semi, a high street office, or a cafe, a large picture window overlooking garden or high street gives a sense of space, even if every table in the cafe is taken. But there are other areas often overlooked when considering how to brighten up and modernise the interior of house, office, or reception area – the staircase. For over 30 years, UMG have been at the forefront of glass construction techniques. Have a look at your existing staircase. Is it looking a bit old and tired, wooden spindle balustrades, or maybe solid balustrades, making an already small area look even smaller? There is little doubt that adding a glass stairway and balustrades immediately lifts the interior to ‘professional’. The low profile of glass and steel, in conjunction with clear balustrades, gives the whole area the illusion of more space, even though the stairway area remains the same. Of course, we don’t just replace one for one. Our team of in-house designers have the latest CAD software to be able to bring to life any style or shape of glass stairway you envisage. And we’re always up for a challenge. Your project will generate a project manager, who will work closely with you from the design stage through to the completed job, ensuring smooth running from start to finish. If your remit is to refurbish and modernise the interior of an older building, consider the use of modern construction materials. 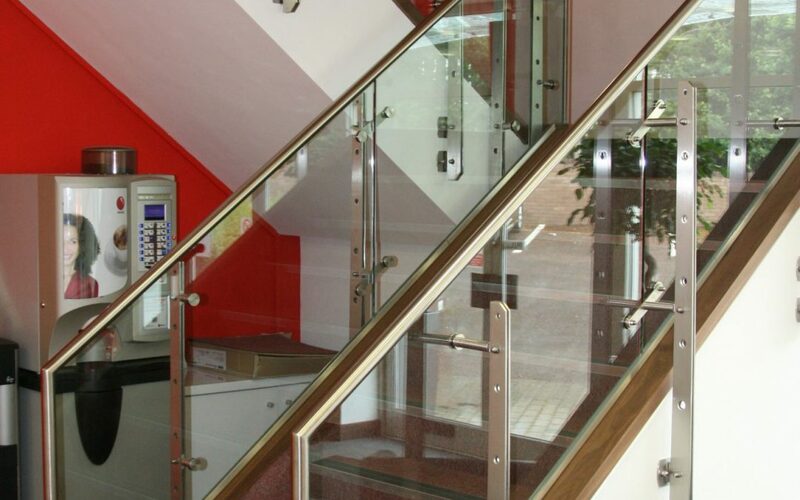 The careful use of colours, lighting, and accessories, along with the inclusion of a glass stairway and balustrades, can transform an old gloomy interior into a modern, attractive, and sophisticated area any business enterprise would be glad to call their own. Don’t take my word for it. Have a look in our photo gallery. If you have your own ideas, talk to one of our structural design consultants. Whatever your requirements we’re here to help. Contact us now, and you could have your new glass staircase and glass balustrades installed before Christmas.